How long will it take to receive my wallet certification card? You will be able to immediately receive your original wallet certification card at the end of our course. How long are your courses good for? All of our CPR/AED and First Aid certifications are valid for 2 years from the “date of issue” of your wallet certification card. Please wear comfortable clothing. Classes require physical activity. Please bring your textbook/student manual if you already have one in your possession. If you do not have one you may purchase one at WorldCPR Learning Centers on the day of class. Please bring paper to take notes. What if I don’t pass the examination at the end of the course? The test is true/false and multiple-choice questions that are pulled from the course material, so you can re-review the curriculum if you don’t pass the first time. There are no additional fees or charges for reattempting the test. Each course title has a different fee, please review class information and pricing. Is your certification accepted by my state? 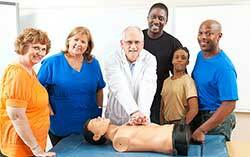 WorldCPR Learning Centers is an approved training site for the American Heart Association (AHA) and EMS Safety Services. We offer same day certification from AHA and EMS. It is the student’s responsibility to determine the certification acceptable at their agency/office. All of our instructors are healthcare or career professionals that are certified American Heart Association (AHA) Instructors with updated credentials. I missed a class, do I have to pay to reschedule? Each student gets a ONE-TIME free reschedule option to use if after registering for a class. If something comes up and you need to reschedule please contact WorldCPR before the date/time of the class to reschedule. There are penalties for no-shows and rescheduling close to or after the date/time of the initial class. Please review the rescheduling policy for more information. We understand things happen and circumstances change. So for organizations and individuals, there is no charge if you need to switch the class to another date or time following the rescheduling policy. For all, if you want to cancel a class within 24 hours of registering, individuals or organization can receive a full refund. However, in all other cases for organizations and individuals please reference rescheduling and cancelation polices. 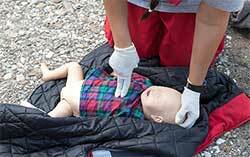 WorldCPR Learning Centers simply known as WorldCPR is conveniently located at No. 8700 Central Avenue, Suite 207, Landover, MD 20785. Do you have parking at your location? Is your location accessible by Public transportation? WorldCPR Learning Centers is easily accessible by public transportation. We are located next to the McDonalds.